No matter what the season, it’s time to fish at Lake Tahoe. Grab a pole and let the expert North Lake Tahoe fishing guides lead you to the hottest fishing spots on the lake. You are sure to come ashore with a whole string of mackinaw, rainbow trout, brown trout and kokanee salmon. Whether you are on the lake or hitting one of the many local streams, this is your chance to come home with a fishing tale that even your kids will be bragging about. Check out Mickey’s Big Mack Charters at Sierra Boat Company in Carnelian Bay. Mickey Daniels is a master fishing guide with 45 years of experience and has a sport fishing boat equipped with the latest in electronics and gear. Book a private and personal charter with Captain Chris’ Fishing Charters. Captain Chris will guide you to some of Lake Tahoe’s best kept secret fishing holes and will even fillet your catch for you when you get back to shore. Fishing is a fun way to spend the day with family and friends, and there are many great Lake Tahoe fishing charters ready to outfit you and get you on the water with ease. You are sure to come back with a pile of fish to enjoy and stories to tell. There’s nothing more relaxing than a day spent hunting for the biggest catch of them all. 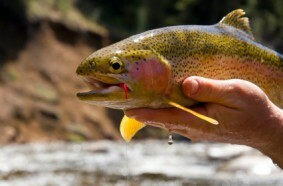 Make Lake Tahoe fishing a part of your vacation plans.